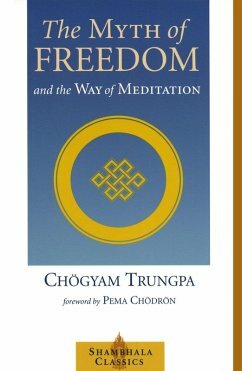 Chögyam Trungpa's unique ability to express the essence of Buddhist teachings in the language and imagery of modern American culture makes his books among the most accessible works of Buddhist philosophy. Here Trungpa explores the true meaning of freedom, showing us how our preconceptions, attitudes, and even our spiritual practices can become chains that bind us to repetitive patterns of frustration and despair. This edition features a new foreword by Pema Chödrön, a close student of Trungpa and the best-selling author of When Things Fall Apart. Chögyam Trungpa (1940-1987)-meditation master, teacher, and artist-founded Naropa University in Boulder, Colorado, the first Buddhist-inspired university in North America; the Shambhala Training program; and an international association of meditation centers known as Shambhala International. He is the author of numerous books including Shambhala: The Sacred Path of the Warrior, Cutting Through Spiritual Materialism, and The Myth of Freedom.